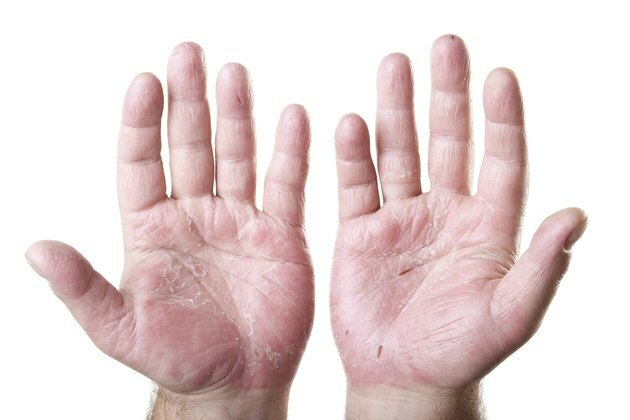 Dryness attacks the hands with a fury, causing shaggy cuticles, itchy palms, finger fissures and flaky skin. Dry hands can also make you look older than your years as this already thin skin thins even more. The best hand creams nourish and heal, as well as provide sun protection. A dry climate, such as conditions in the deserts of the Southwest, or a particularly brutal winter when the combination of cold wind and indoor heating rob your skin of moisture can cause the skin on your hands to suffer. Frequent exposure to water and chemicals can also cause your skin to dry excessively -- hair-care specialists, dish washers and healthcare workers, for example, are especially susceptible. Hand eczema or dermatitis is a chronic condition characterized by redness, itching, peeling, flaking and cracks on the skin of the hands. For eczema, lotion may help -- but you may also need to consult a doctor for more specific treatments. The best hand lotions for dry skin usually contain one or more of these ingredients: glycerin, urea, pyroglutamic acid, sorbitol, lactic acid, lactate salts and alpha hydroxy acids. Silicones and humectants are other critical ingredients that help maintain your skin's moisture. They make for a cream that coats and moisturizes without leaving you feeling greasy or sticky. Also, seek out a moisturizing cream -- even in winter -- that contains an SPF of 30 or greater. Your hands are continually exposed to the sun, which is both drying and damaging. A moisturizing lotion does more harm than good if you have a reaction to one or more of the ingredients. Natural oils, such as shea butter, avocado oil, sunflower oil and coconut oil, soothe and provide moisture, and are less likely to cause a reaction than synthetic ingredients. The best lotions for sensitive skin usually contain no added fragrances, a potential source of irritation. Determining the best lotion for your dry skin depends on the cause and severity of the dryness. What's best for a nighttime lotion may differ from a daytime version, for which a high SPF level and a fast absorption rate are essential features. A few lotions that contain several of the critical moisturizing and soothing ingredients are EOS Everyday Hand Lotion; Cetaphil Therapeutic Hand Cream; Kora Organics by Miranda Kerr Daily Hand Cream; and Eucerin Daily Skin Balance Skin-Fortifying Hand Creme. This list is in no way exhaustive -- many excellent products exist. Examine the ingredient lists and sample the lotions in the store to see which ones are right for you. What Causes Very Dry Skin in a Humid Climate?